A close family member became ill while traveling, and required emergent hospitalization. So I boarded a flight to provide support during what ended up being a weeklong hospitalization: the first two days at a small (~50 bed) local hospital, the rest at a large (>500 bed) tertiary care hospital. There is nothing private about semi-private rooms. Multiple patient rooms are inimical not just to infection prevention, but also to privacy, confidentiality and basic human dignity. We learned much more than we ought to about the person in the neighboring bed, and vice versa. Add to that the additional interruptions, alarms (see below), and frequency with which health care workers moved from one bed to the other without performing hand hygiene, and I am more convinced than ever that single patient rooms should be the standard in all health care facilities. And “semi-private” should be replaced by “non-private” or “multi-patient” as a descriptor of hospital rooms. Hospitals are aural assault zones. Most hospitals now have “quiet” or “hush” campaigns, laudable efforts to reduce noise. But noise from the hallways is a very small part of the problem. Seemingly everything in the hospital room makes noise! The IV pump (even when it isn't alarming, in some cases), the nasogastric suction, the various alarms (IV pump alarms, bed alarms), compression devices, intercom messages, code announcements … I've long had a pet peeve about IV pump alarms, but my concerns now encompass many additional noise sources—a long overdue solution is to re-route the pump alarm elsewhere (nurses' station, pager), which also obviates the ridiculous step of requiring the patient (or family member) to press their call button to inform their caregiver that their IV pump is alarming. Engineering solutions to reduce noisy interruptions are essential. Expecting patients to “speak up” and advocate for themselves is unrealistic. Acute care hospitalization is a traumatic experience, and once admitted the focus of the patient (and family) is simply on surviving the hospitalization and getting home. The default approach is often passive acceptance and deference to the treating caregiver. It's not just that you don't want to upset your doctors and nurses, but you also strongly want to believe that they are doing the right thing(s). We hesitated on more than one occasion when, in retrospect, it would have been better to speak up sooner, or more directly (on two occasions it might have prevented a complication). If even physicians are slow to point out problems or ask questions, how can we expect others to do so? Finally, a kind word, a smile, and some ice chips can make a massive difference! Kindness may not be the only thing that matters (the right diagnosis and treatment is also kind of important), but it goes a long way. 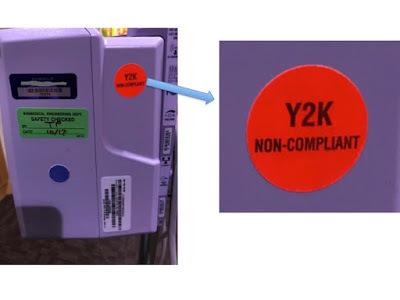 Speaking of smiles, this sticker on our IV pump provided one during the first hospitalization, and helped explain why the pump was so noisy … it was Y2K non-compliant! A real confidence-booster!